Forgeline Motorsports has begun manufacturing a new 3-piece, aluminum RS-OE1 “Steelie” wheel style exclusively for the fellas at Roadster Shop, and if you’ve got an old, vintage Chevrolet lying around that could use an update, we’d recommend checking them out. Roadster Shop is actually the mastermind behind the new “Steelie” wheel design , which is available with a 19-, 20-, or 22-inch diameter, with widths ranging from 7 to 12 inches. Aesthetically, it works well with virtually any classic car, especially the sleek first-gen Chevy Chevelle Malibu you’ll see in the video above. Forgeline notes that the uniquely machined center allows for the use of a 10.5-inch cap without the need for clips or adhesives, allowing you to get just the right look for your ride. The wheels are made-to-order, and are comprised of forged 6061-T6 aluminum centers with heat-treated rim-shells and American-made stainless-steel ARP fasteners. Unfortunately, quality comes at a price; a single 19-inch wheel costs more than $1,600, meaning that to fit any vintage whip with a full set of these sharp-looking wheels would command at least $6,500. Ouch. 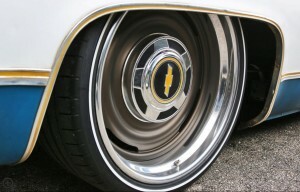 Check out the video to get a good look at these custom, made-to-order wheels, and for more info, visit RoadsterShop.com.